How Much Can You Improve After High School? In my previous article Why Usain Bolt is so Dominant (and Tyson Gay, too), I outlined how Usain Bolt’s top speed at 60-80m is over 3 percent faster than Ben Johnson or Mo Greene. That’s quite a bit considering less than 1 percent makes a difference between 1st and 4th. The other article How Long Does it Take to be a World Class Sprinter? 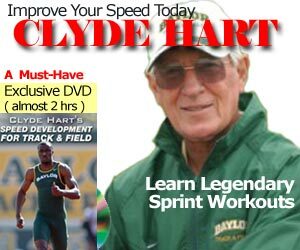 outlined how you can reach World Class anywhere from 1 to 6 years after you demonstrate sprint speed at a younger age. So we know when but how much better can you perform? Sure, there are Outliers, but I am trying to get a general average. As you can see from the chart below, the percentage increase varies from 1 to 5 percent, with about three percent being the norm. Unless your kids have a disposition to endurance or aerobic sports, make sure your they are involved in a program that involves speed, power and strength. Then those attributes can be translated to any sport, be it Track & Field, or any other high paid team sport. Histories of the 20 fastest male American 100m sprinters. Ranking of sprinters and fastest 100 m times at age 19 and older obtained from U.S.A. Track and Field (http://www.usatf.org) and I.A.A.F. (http://www.iaaf.org) performance data. a-Percent improvement = 1 ? (fastest 100 m–100 m time at age 19) × 100.
b-World class status defined as either (1) representing the U.S.A. at international championships (e.g., Pan American Games, World Championships, Olympic Games) in an individual sprint event or as a member of a relay team or (2) participating in the U.S. Olympic Trials which requires the athlete to meet Olympic A or B standards to qualify to compete at the Trials. d-C. Lewis was the 5th ranked long jumper in the world and 2nd ranked long jumper in the U.S.A. by the age of 18.
e-NA = no data/information available.